I’ve been quiet around here lately. You know the feeling where there’s so much you could say, but none of it makes sense yet? And if you speak too early, it feels like you might scare away the new thing growing in your heart? That’s been the last several months in my world. But it’s time to talk a bit about it. Here’s my Easter message I shared with my beloved community. If you’d prefer, you can watch it here. We all have a 5 year old inside of us that’s holding a brightly colored balloon. We’re fascinated by it. 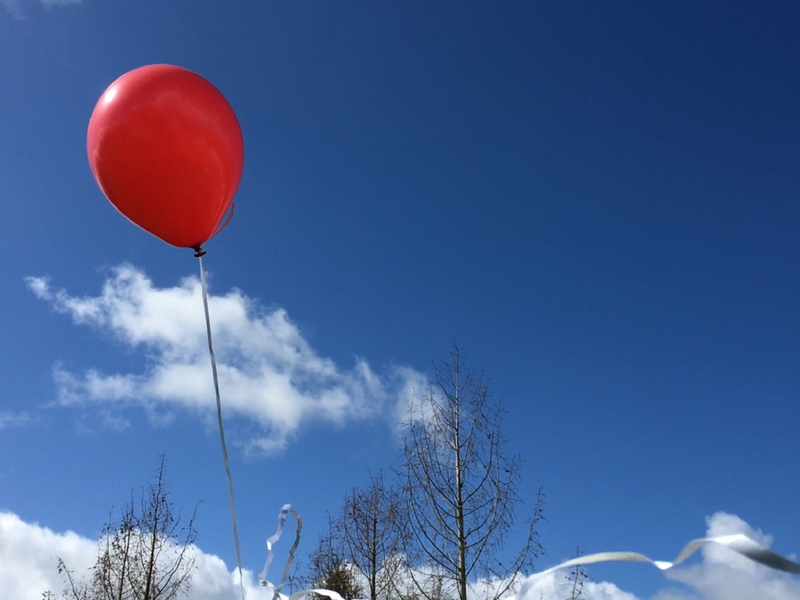 It bounces along, goes where we go, we have no other goal than watching what this balloon does. Pure joy and curiosity. Wide awake and bright eyed. That 5 year old is in you. Some of you know this and you’re in touch with this 5 year old. They come out to play many days. But many of us don’t know this 5 year old anymore. We took their balloon away a long time ago. Popped a hole in it and watched the air rush out with a force that took part of our soul with it. Or maybe we let go of something important to us and it simply drifted away. Someone hurt us so we started to armor up. We figured out how to protect ourselves from getting hurt again. And the 5 year old had to pack up their toys and fade into the background. And now we walk around as adults seeing the balloons of others and wondering why we can’t just be like them. Everyone else looks like they’ve got it together. We hold and hide our half deflated balloon inside, trying to protect the air we’ve got left. We’re just trying to get through life. But here’s the thing. The One who created you wants you to know your 5 year old self. To know joy, curiosity, childlike faith. God wants you to play, to hold your balloon full of glorious air with delight. Today, I want to tell you about a resurrection. About new life in the midst of fear. A story about getting a new balloon. Yes, the Son of God walked to the cross, was crucified, he died and was buried. And on the third day, he rose from the dead. He woke up and death died. I could tell you about what Jesus did back then. But this morning, I’m going to tell you what Jesus is doing today. Like in the last four months. In me. I’ve struggled with high functioning anxiety and panic attacks for all of my adult life. Somewhere along the way, I believed the lie that if I could just be perfect, life would be okay. I would be safe. I wouldn’t get hurt or feel discomfort. Or feel out of control. These patterns became deep ruts that guided my life. There was no getting out of them. They were facts, it seemed. The fear of imperfection, failure, being out of control was always close by. So much so that I learned to construct a life around them. And the absolute grace in this life? Is that I created a life I love, while being afraid. A spouse, our children, this calling to be a pastor. This is the life I want. I found I could walk with God deeply even while dragging a deflated balloon behind me. And the thing about perfectionism is that lots of energy went toward denying the balloon was even deflated. It still amazes me actually. That we can surrender parts of our lives to the resurrection power of Jesus Christ, and other parts of our lives continue on in destruction and unhealth. It’s almost like grace is real. Jesus comes to us in our mess, not our perfection. The thing about high functioning anxiety is that no one really knows it’s happening. You can still function. Fairly well on the outside. But I wasn’t at peace inside. My insides did not match my outsides. That sense of fear and dread was ironic as I preached on Sunday mornings that God offered us joy and peace in this life. Sometimes, I think I preached mostly to myself. Others just got to listen in. I so desperately wanted the good news of Jesus to be true. And part of me knew that it was. Almost as if my balloon was half filled with air from God and half filled with stale air from my fear. Fast forward to this past fall. We’ve all been a bit shell shocked as our country figures out how to navigate these confusing times. Needless to say, I sensed the anxiety in our country, in my friends, family and our church and felt it deeply. I wondered where God was calling me to respond and lead. I found myself holding a couple things in tension. Where’s our call to be prophetic, to lift up the Gospel, of a man who was crucified because he challenged and subverted the political system of his time? And where’s our call to be a safe place for everyone, where we can be in relationship, even though we see things from different perspectives? Then as the inauguration happened and the women marched and the world braced itself for what might happen next, my anxiety was speaking out, loud and clear. The panic attacks while preaching started again. Here, in this room, several months ago. A couple days after one of those, during my annual physical, my doctor felt something on my thyroid and asked me to get an ultrasound. As I drove home from that appointment, she called with the results and said she wanted to do a biopsy. “To be prudent, to be sure it was nothing.” My heart sank. Seriously? With everything I’m trying to navigate, now this? I got a biopsy that Friday afternoon and entered into the waiting. I knew right away that this was a moment I needed to pay attention to. I could continue in this ridiculous dance of acting like I was fine when I wasn’t fine. Or I could do the thing I knew God was inviting me to. To wake up, again. To a new area in my life where Jesus was not Lord. To journey into the places in me that I’ve avoided, out of pure fear. To shine a light on my auto pilot and habits that were sucking the life out of me. To remember resurrection means God does God’s best work in places that appear dead and lifeless. So I did it. And the voice that called on Monday afternoon and said, “It’s benign,” was nice. But the gift of being forced up against the wall and seeing my life with new eyes, that was gold. So here’s what resurrection looks like to me this year. Resurrection is showing up to therapy every week. 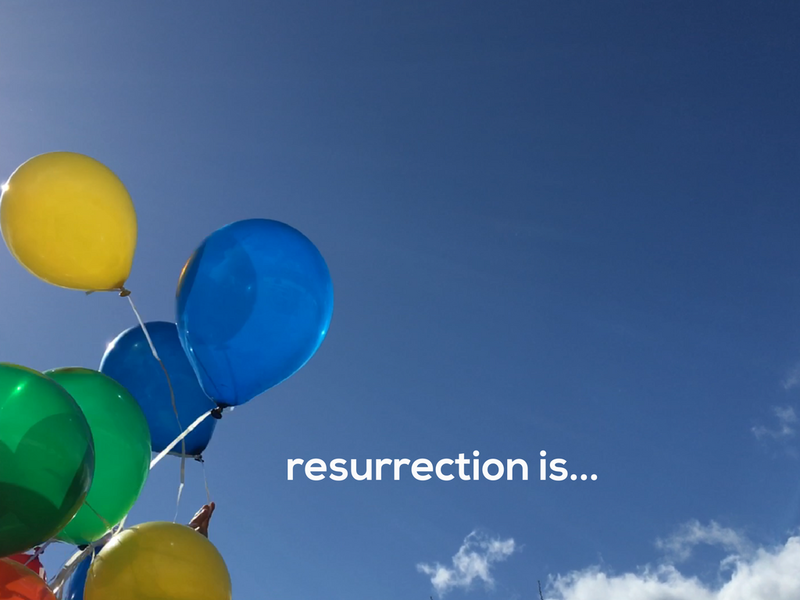 Resurrection is downloading a meditation and prayer app and learning how to sit still and let the inner drama of our mind start to settle down. This can feel terrifying at first. It was the exact space I’d avoided for years. But after three months straight of practicing, I’m now comfortable with the silence. It’s teaching me everything I need to know. God is there. My heart is there. My soul can breathe more deeply because it has space. Everything falls away that’s not important. Life has gotten lighter, simpler, more joyful. Resurrection is kind of a mess. It doesn’t happen on our timeline and has no controlled outcome. For me, it means tears, writing, walking, listening, questioning and sharing. Resurrection is seeing the voices of shame for what they are. Lies that we picked up along the way and believed deep down in our soul. Those voices don’t get to tell us who we are. Only the One who created us gets to do that. The problem is we don’t usually get quiet enough to listen. Resurrection is asking new questions in spaces where you were sure the old assumptions were true. Resurrection watches the pieces of your life become beautifully dismantled. Pieces of the you you’ve always been are lying on the floor and it’s simply beautiful. It takes your breath away when you realize you don’t need those pieces anymore. Resurrection is meditating and praying one quiet afternoon in a silent home. And bringing to mind an image of your 5 year old self and asking if there’s anything she wants to say. I look around, thinking this is kind of weird. But I stay quiet anyways. I felt an image of my 5 year old self pulling on my shirt saying over and over, “I just want you to be safe.” And I kept saying right back, “I am safe.” Tears flowed. More than I’d cried in years. 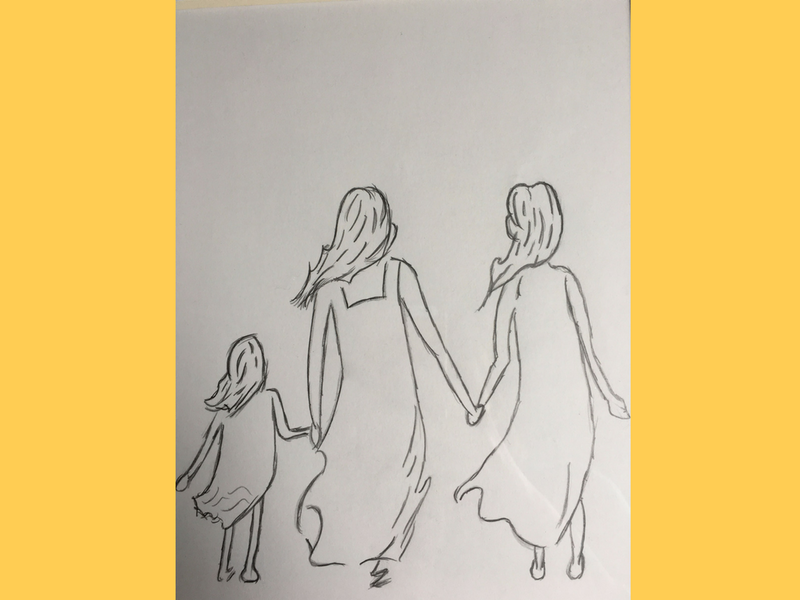 I comforted the 5 year old in me, who hadn’t gotten to grow up yet, because she was so afraid. I sank deeper into my life that afternoon. Resurrection is realizing I can tell my church that all of who we are is welcome here, God can handle it. And maybe that even means me. Resurrection sees the despair in skimming the surface of our existence. That the best parts of us are below the surface. Way below the surface. Resurrection calls us to those places. And in those places we find freedom and joy. What if our freedom lives inside our fear? Friends, I simply had no idea how much the patterns of fear had shaped my life. They set up camp and I learned how to circle around them. I didn’t know I could welcome them in and ask some questions and that they had something to teach me. People in the Jesus story today knew fear. It was mentioned several times in this short story. The guards were terrified. The angel tells them there’s nothing to fear. The disciples are afraid but they listen anyways. Jesus tells them not to be afraid. Why is fear such a theme in resurrection? A new life, a new shiny, bouncy, joyful balloon is given to us, and we’re terrified. Are we scared of joy? It can feel out of control. Are we scared of becoming new? Of leaving the known of our fear to enter the unknown of what Jesus is offering? Yeah, probably. Think for a moment about the places in you or in this world that you’ve avoided. The rooms you locked a long time ago and put up yellow caution tape and a “No Trespassing” sign. The good news of the gospel of Jesus Christ is that Jesus wants you to go into those rooms. The even better news is that He’s already there. Waiting for you to open the door. I imagine opening the door to see Jesus there, sitting on a chair, holding a balloon for us. What might you find? I don’t know. But it’ll be okay. Because Jesus walked to the cross, was laid in a tomb and rose again, I know Christ is alive. In you. In me. In the people who drive us crazy. Christ is holding out a simple, joyful balloon full of new, clean, fresh air. A new way to breathe. A new way to wake up. And that fear? It’s still with me. And the thing you’re trying to outrun? It’ll stay with you for a while. But we don’t have to be afraid of it anymore. I’m ready to call it out when I see it and choose a different path. My waking up has been about integration. About fitting the different parts of my life together in one new story. Can I show you something my husband made me? It’s me holding the hand of my 5 year old self who’s learning the world isn’t such a scary place. I’m also holding the hand of my 20 year old self who’s learning it’s okay to trust, to fall in love again and to be vulnerable. What a gift to look at this each day! Made for me by someone in my community, my family. Friends, never underestimate the power of community on these journeys we make. You are not alone. If you’re looking for a community of friends, we’d love to be your community. We’re not perfect, but we show up. Happy Easter, my friends. Jesus is alive. May that be good news to your heart this day. Amen! Next what’s replacing the fear?